The Qaraqalpaq yurt is generally known as either an otaw or a qara u'y. 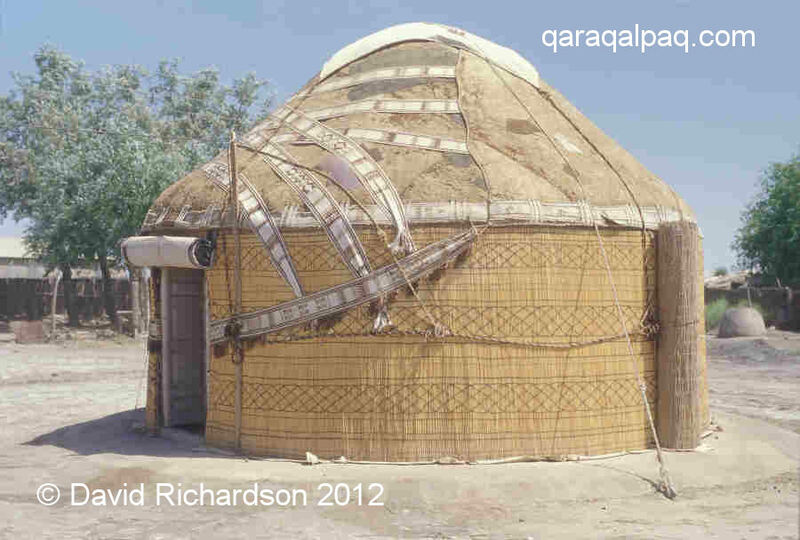 In the past an otaw was strictly a festive yurt for newly-weds and a qara u'y was an everyday yurt. Now these names seem to be interchangeable. The place for the erection of the yurt is known as the jurt. As we have noted elsewhere, the use of the word yurt to denote a portable dwelling is strictly incorrect. It actually relates to the ground on which the yurt stands, or to a campsite, or to some other type of tribal territory. Previously the jurt was usually a circular section of packed clay, somewhat larger in diameter than the yurt and raised a little above the surrounding ground in case of rain. Now a custom-made circular section of raised wooden flooring is quite common. This can even contain slots for locating the door threshold. A yurt under a specially made shelter at Qazayaqlı awıl. The term u'y jay can also be used instead of jurt. Its literal meaning is ‘yurt place’. Traditionally this was a special roofed area or even a tall room inside of which the yurt was erected. Completed carcass of a Qaraqalpaq yurt at Sanqıbaev's workshop in Shımbay. The walls are made up of a number of trellis sections or qanats. The literal meaning of qanat is wing, quite a good description since a wing opens and closes. In the past these were often made of janewut (Salix songarica Dode) but they are now more likely to be made from poplar (terek) or willow (aq tal). This is due to the shortage of janewut because of the changing environmental conditions. The poles which form the qanats are called sag'anaq. 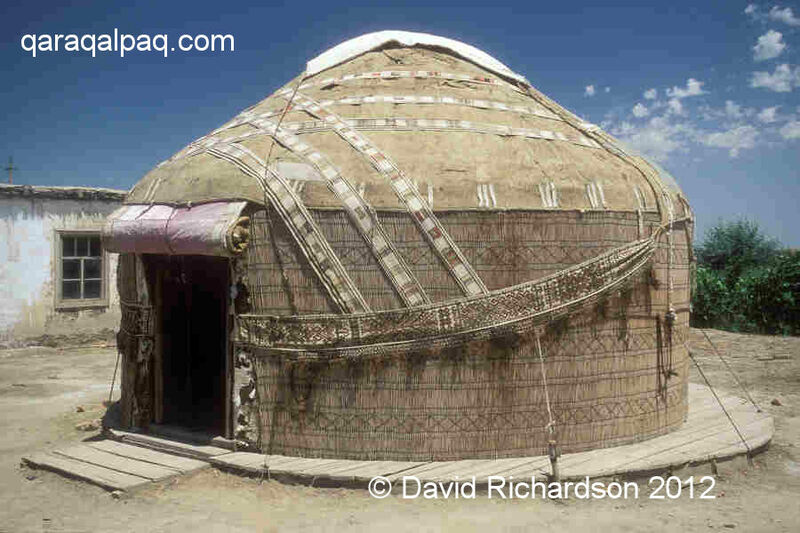 They are slightly bent and are round in section unlike those used in the Qazaq yurt, which are flat. They are linked together using strips of camel hide (ko'k). Each pole has 21 holes which are positioned so that there is no hole at every fourth intersection. Consequently the poles of the qanat are not joined together at every joint. The position without a hole is called 'azat' (free). The inner poles run from top left to bottom right in the same way as the Turkmen qanat. In Qazaq, Uzbek, and Kyrgyz yurts they run from the bottom left to the top right. The ko'k have a slit close to each end. The ko'k are put through the holes in the qanat poles while damp and then each end is passed back through its adjacent slit thereby forming a small loop on each side. When the hide dries it tightens and forms what is effectively a leather rivet. The diamond shapes formed when the qanat is opened out are known as ko'z or eyes. The qanats are joined together by lengths of narrow tapes, only 4cm wide, known as dizbe. They are normally patterned and are flat-woven from wool. Individual dizbe are not very long, so that they are easier to tie and undo. The joint of each qanat is known as a qarıstırıw, which literally means a crossing. 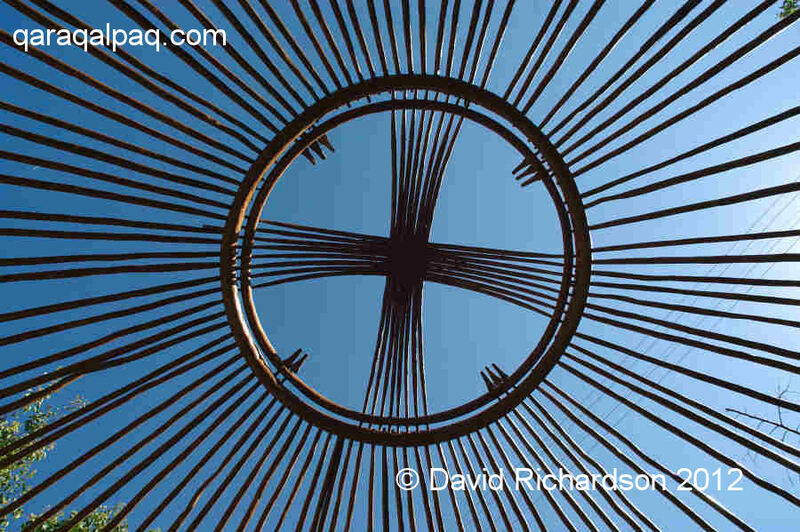 When the qanats are joined together to form a circle (completed by the addition of the yurt door) they become the kerege and the diamond-shaped holes are then known as the kerege ko'z (eyes of the kerege). The forks formed at the top of the kerege by the poles crossing over each other are known as the keregebas (the head of the kerege). The doorway of the yurt is made up of various parts which can be easily dismantled, typical of all Turkic yurts. The entire doorway is known as the ergenek and this name is also used specifically for the pair of hinged wooden doors which fold inwards. The upright struts, or door jambs, are known as the tulg'a. The threshold is the bosag'a and the lintel is the man'laysha (from man'lay, forehead). The doors of Qaraqalpaq yurts were often plain and undecorated. Carving and, in particular, painting of the doors in bright colours became more popular in the 1940s and 1950s. In the 1920s and 1930s this had been considered to be a 'Qazaq taste'. According to Savitsky some craftsmen preferred to use Amu Darya willow (Salix oxica, known locally as sog'ıt), or pine (qarag'ay) for the door panels. According to our research sog'ıt was indeed used for door panels but its botanical name is Salix alba. Salix oxica is in fact aq tal. It also seems strange that he refers to the use of pine, as both pine and birch (qayın') are generally considered by the Qaraqalpaqs to bring misfortune and sterility. In addition to the inner pair of wooden doors the yurt also has an outer roll-up door called an esik. This is fastened to the uwıqs (poles linking the kerege and the roof-wheel thereby forming the roof of the yurt) above the man'laysha with the aid of three ropes which are sewn to its upper edges. It is rectangular in shape and is slightly larger than the ergenek and tulg'a so that when it is rolled down all of the gaps are covered. It is made of a reed screen sewn onto a base of felt or other thick material. 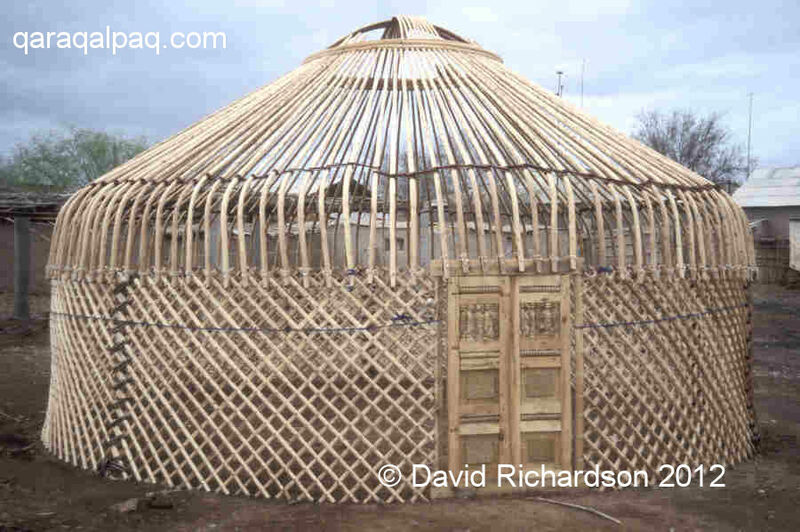 Winner of the best yurt in Moynaq competition in 2004. Esiks are ornamented in a traditional way with vertical strips in appliqué or combination technique sewn onto the sides. These are known as shiyqayıw. 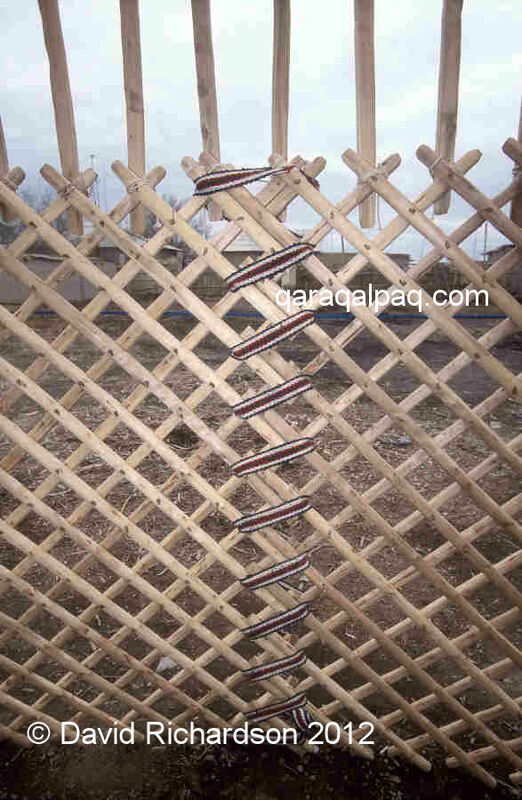 Another horizontal strip is sewn onto the bottom of the esik overlapping the shiyqayıw, designed to prevent the ingress of water. This is known as the suwag'ar, which literally means gutter. In the centre of the esik is sewn the duwashıq. This is made from material in the form of a triangle with the point downwards. It generally has tassels at each of the corners. The shape of this triangle calls to mind the tumar amulet and it is connected with pre-Islamic beliefs. Similar protective triangles can be seen on the back of men's postın coats and on children's clothing. In the past pieces of paper with verses from the Qoran were sometimes put into a pocket in the duwashıq, thereby fulfilling a similar role to the ha'ykel worn by girls and women. The ishki beldew (inner waist belt) is a 30-40cm wide band which is positioned, with its pattern facing inward, through the gap between the right hand door leaf and the tulg'a and runs around the outside of the yurt halfway up the qanats. The end goes through the gap between the left hand door leaf and the other tulg'a and is turned back on itself by about one metre. The ends of the fringe are used to tie it to the kerege. This adds vital structural stability by constraining the circular wall. The ishki beldew is made from a warp and weft of white cotton and is patterned with coloured wool or silk threads using the pileless continuous supplementary weft weaving technique. 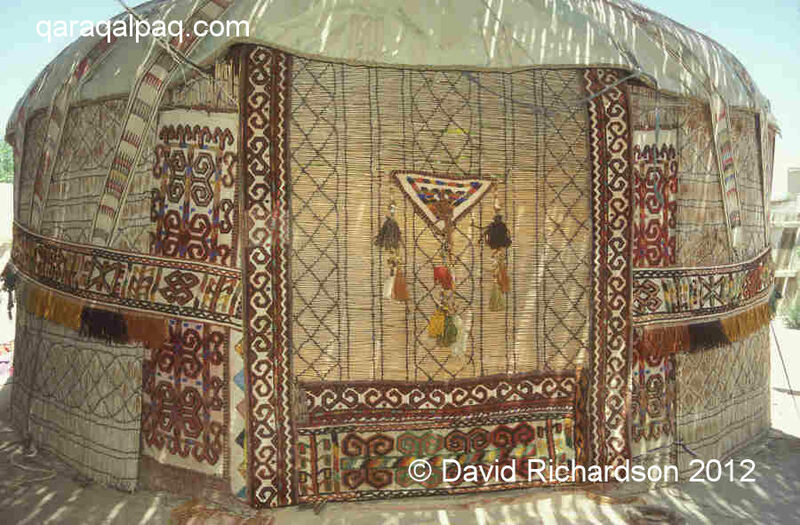 The qızıl basqur, or red main band, is a 60-70cm wide woollen pileless tent band. It is usually red and black. 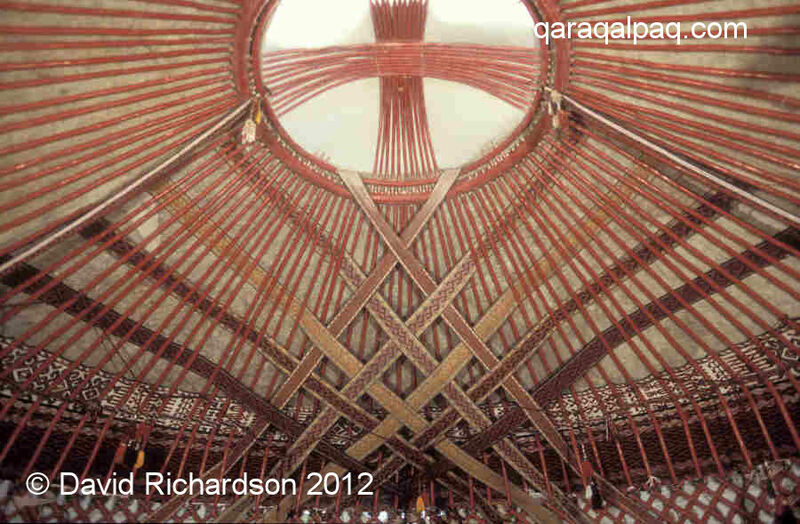 It has an important structural role to constrain the circumference of the roof and thereby maintain its pitch. Its bottom is aligned to the joint between the kerege heads (keregebas) and the uwıq. Its upper edge is aligned to the start of the iyin or bend of the uwıq. The aq basqur positioned above the qızıl basqur. The aq basqur, or white main belt, is a 40-50cm wide belt woven in combination technique. It has a white cotton warp-faced ground and is decorated with a raised woollen pile. The bottom edge of the aq basqur is aligned to the top edge of the qızıl basqur, with its decoration facing inwards. The top edge is above the iyin of the uwıqs. The aq basqur protects the outer felt from stretching or sagging in the gaps in between the uwıqs. The belt begins and ends above the door in line with the tulg'a. The beljip, or waist rope, sits over the shiy (reed screen) approximately halfway up it. The two ends of this rope go from the tulg'a and are tied at the rear of the yurt. In the past a wider belt known as the sırtqı beldew (outer waist belt) was used. Occasionally the beljip is also called by this name. If a yurt is located in an exposed position ropes may be tied to stakes and fastened onto the beljip. In some remote villages the owner might tie an old metal wheel hub or a few heavy engine parts to the beljip instead. 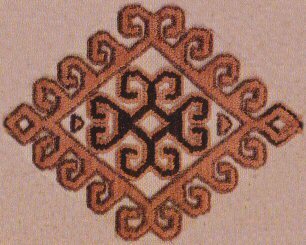 The loose ends of the aq basqur are concealed by the esikqas (which literally means the brow of the door), a small decorative rectangular all-pile weaving. This is positioned behind the uwıqs facing inwards, exactly in line with the door above the qızıl basqur and overlapping the ends of the aq basqur, thus "completing" the pattern around the yurt. A pair of ishki janbaw, or inner side tapes, are sewn to each side of the esikqas and hang like garlands with their other ends tied to the keregebas. The ishki janbaw are narrow tapes, woven in combination technique with a symmetrical design and a lower fringe of red and green tassels. Today it is very unusual to see a yurt with an esikqas. Where they still exist it is now more common to position the esikqas in front of the uwıqs so it can be fully seen. The interior of a wealthy ex-Communist's yurt in Xalqabad. The ayaqbaw are a set of brightly coloured woollen cords with tassels at the end which are hung from the shan'araq and uwıqs to great decorative effect. Shiyo'n'ir, or the breast of the shiy, are ornamented strips that hang vertically on either side of the outside of the yurt door. They are woven on a white cotton ground and are patterned with a woollen pile woven in combination technique. The pattern is usually a bold amuletic qoshqar mu'yiz or ram’s horns design. A pair of sırtqı janbaw (outer side tapes) hang like a garland at each side of the yurt door, mimicking the internal ishki janbaw. These too are woven in combination technique with a symmetrical design and a lower fringe of tassels. They are wider than the ishki janbaw, but not as wide as the aq basqur. One end is fastened to the tulg'a at the level of the beljip and the other is attached to a corner of the rear felt. The roof of the yurt is formed by long poles, known as uwıqs, attached to the keregebas and the central roof wheel or shan'araq. The uwıqs are round in section and generally undecorated (unlike Qazaq uwıqs). The uwıqs are bent part of the way along their length, leaving one long straight end and one short straight end. The bend is known as the iyineu (from iyin, shoulder). It is this single short bend which gives the Qaraqalpaq yurt its distinctive conical shape. A hole is drilled near the bottom end of each uwıq and this has a cord attached to it by means of which it is fastened to the keregebas. This cord is known as the uwıqbaw and is made of black goat’s hair and white sheep’s wool twisted together like a barber’s pole. The top end of the uwıq is sharpened and is known as the qa'lemshe (literally pencil). The shape of the Qaraqalpaq shan'araq is quite distinctive. 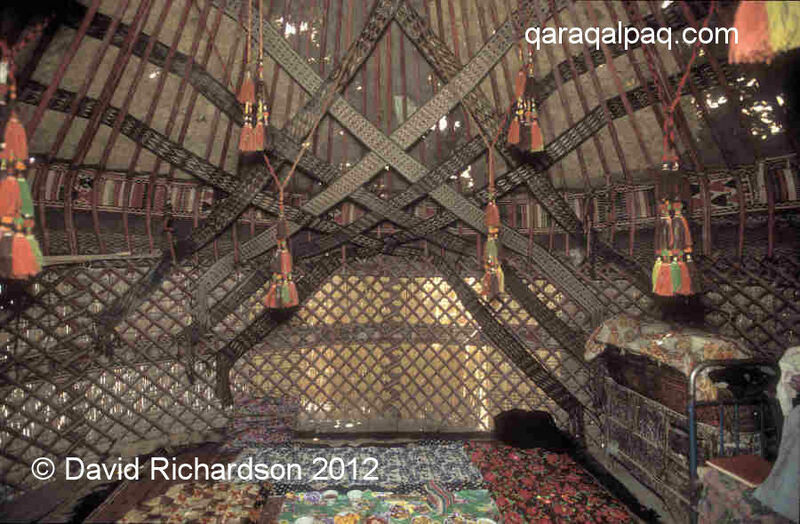 The roof wheel or shan'araq of the Qaraqalpaq yurt is much more solid than that used in the Turkmen or Qazaq yurt. It has two rims, an inner one and an outer. The outer rim has holes through it, known as ko'z, into which the uwıq are inserted. The convex top of the sha'naraq is formed by a set of thin laths which are splayed at the ends like a Maltese cross. These fan-shaped laths are known as the bo'genek. Arrow-shaped pieces of wood protrude from the rim of the shan'araq towards the centre. They are placed in groups of three in the centre of each quadrant and are known as gu'ldirewish. These combined with the double-rimmed shan'araq unmistakeably identify the Qaraqalpaq yurt. The shan'araq is often lifted into position using a long post with a fork at its upper end. 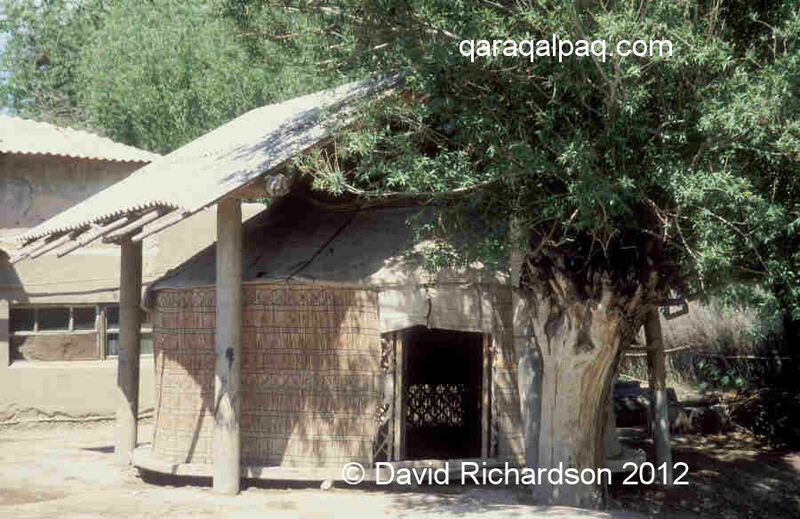 This post is known as a baqan and it is also used for placing the felts on the roof. Sometimes four uwıqs are tied together with a dizbe to make a temporary equivalent. More dizbe are used to uniformly separate the uwıqs and to strengthen the structure. As this is done the uwıqs start to shift about and need a lot of adjustment. The uwıqs have a natural tendency to fall sideways, which would result in the spiral collapse of the roof if left unchecked. By tightly linking the uwıqs at the maximum point of their bend, these dizbe play a vital role in stabilizing the yurt roof. The roof of the yurt is generally covered by three pieces of felt, although in the past poor families often used reed screens as felt was too expensive. All of the parts are lifted with the aid of the baqan. The front and rear roof felts are semi-circular, but the felt that covers the smoke hole is rectangular. The first roof felt is known as the aldıng'ı u'zik and this covers the front area above the yurt entrance. This is put on first. This has a set of 12-15cm wide tent bands known as qızıl qur (literally red band, even though they may not all be red) sewn onto it. 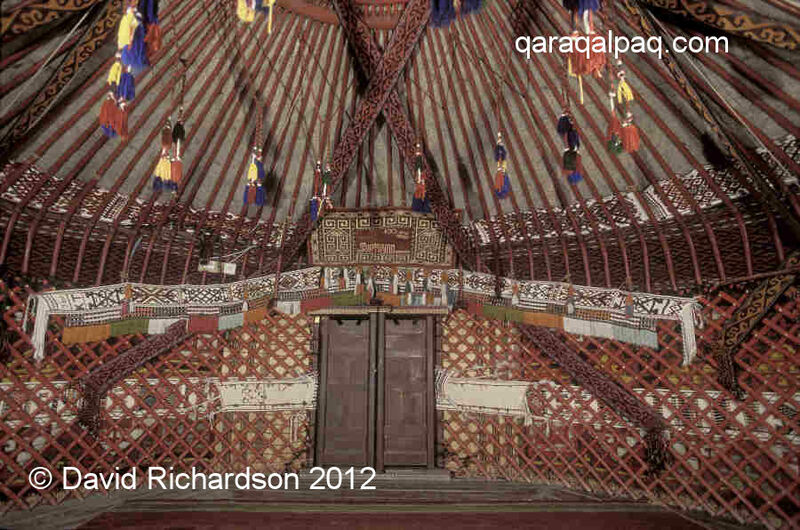 Three bands on each side of the yurt roof are most common but five on each side is a sign of prosperity. The felt is placed on the roof and the qur are allowed to hang down through the uwıqs into the interior of the yurt. These are then interlaced and tied to the kerege to form a net or shatırash above the place of honour (to'r). This gives a very festive appearance to the yurt. We have seen several examples of qurs with family names and dates of births or weddings woven into them. The shatırash in a yurt at Erkindarya, formed by the interlacing of the qızıl qur. The second roof felt is known as the artqı u'zik and this covers the rear of the yurt. It is the same shape as the front felt and also has narrow tent bands sewn onto it, this time on the outside. Again there are usually three bands on each side of the yurt roof. These are of white cotton and are known as the aq qur. They are interlaced on the outside of the felt above the yurt door, holding the roof down onto the uwıqs. The bottom of each band is attached to the beljip. The final felt, which covers the smoke-hole, is known as the tu'n'lik. Long ropes go from the corners of the tu'n'lik to the beljip. When they need to open the smoke hole they untie one of these ropes and push the felt back with the aid of the baqan. Screens made of reeds are added to the outside of the kerege. In the past mats made from the stems of the tall and slender perennial steppe grass, shiy, were used (Lasiagrostis splendens Kunth). This grass, which occurs across Central Asia from Russia to Mongolia and China, forms large thick tussocks and its slender stems grow up to 2½ metres tall. Despite being salt-tolerant this plant no longer grows in the delta as it cannot cope with the increasingly high levels of salinity. Today reeds are used instead. Yurt at Taxta Ko'pir with a shiy screen. The screens made from these reeds still retain the name 'shiy screens' regardless of the material from which they are made. They are constructed using goats wool, which was readily available but needed great skill to spin. In many Qaraqalpaq villages all of the outhouses and fences for livestock areas are made of reeds. In the past many poor people who could not afford felt for the yurt roof used reeds instead. The screens are in two sections, each section is attached to one of the tulg'a and then unrolled so that they meet at the rear of the yurt. This means that they can easily be unrolled to let in air during the summer. The height of the shiy screen is level with the bend of the uwıqs. Jez shiy are shiy screens decorated with a geometric ornament by winding coloured wool around each stem. These are rarely seen. Various different coverings are used for the floor of the yurt. Some have patterned felt mats known as tekiymet; others have mats woven from bulrushes (jeken) known as shıpta, or qamıs, known as boyra. Still others have a large woven mat made from patterned woollen strips sewn together side to side, known as an alasha. Sometimes an alasha is tied to the kerege as a wall decoration. The yurt is divided (in a metaphorical not a physical sense) into three sections. The place of honour is known as the to'r and this is opposite to the yurt entrance. This is where the owner receives guests. The other divisions are labelled from the point of view of someone sitting at the to'r looking towards the door. The male half is the on' jaq or right side. Male accoutrements such as saddles, bridles etc. were kept here. The female half is the sol jaq or left side. Equipment for food preparation was kept here. This may include a manual mill (digirman), bags for provisions (shanash) hung onto the kerege, and containers made of hollowed-out pumpkin for storing water. Cutlery and other kitchen items were stored in kergi. These were large bags woven in a variety of techniques. The interior of a yurt at Bozataw. There is generally very little furniture in a yurt. The most common item is the sandıq. This is a carved or painted wooden chest used for storage. 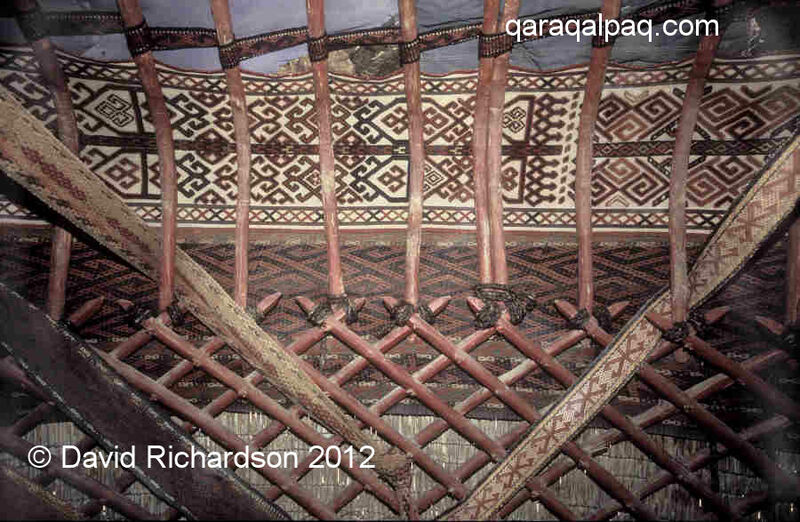 The bedding, thin quilted mats known as ko'rpe, with bright cotton covers is normally stored on top of the sandıq. A qarshın is also sometimes found on top of the sandıq. This is a pile-faced bag used for storing the family’s clothing. Sanqıbaev, Q., Master Yurtmaker from Shımbay, Qaraqalpaqstan, private discussions, 2001, 2002, and 2003. Savitsky, I. V., Applied Art of the Karakalpak Peoples, Carving on Wood [in Russian], Published by ‘Science’, Uzbek SSR, Tashkent, 1965. Xalmuratov, P. X., Dean of Botany, Institute of Pedagogy, No'kis, Qaraqalpaqstan, private discussions, 2003 and 2004. This site was first published on 6 July 2006. It was last updated on 6 March 2012.